It might be hard to believe that the happy-go-lucky, and sometimes downright goofy, Boxer was bred to be a guard dog, but the breed’s physique and work ethic make it apparent. Boxers are medium-sized, muscular dogs with short coats. They look like Olympians and run like them too. But, don’t let their courageous hearts and statuesque bodies fool you—Boxers are incredibly sensitive dogs in a multitude of senses. Read on to find out more about Boxers and whether one might be right for you! According to the American Kennel Club (AKC) the Boxer’s roots can be traced all the way back to 2,500 B.C. but their more immediate German relative was the Bullenbeisser, a much larger dog used for big-game hunting. In the late 1800s, the Boxer we know and love today emerged. Since then, they’ve served in the armed forces, as guard dogs, and even as service dogs! Boxers have boundless energy and love to play for hours. After all, they are classified as working dogs! Because of this, active individuals or families would be ideal for them. The Boxer’s high energy will also inform the training tactics that will work best, whether you’re starting with a puppy or teaching an old dog new tricks. Training that incorporates exercise and positive reinforcement will likely work best. Generally speaking, Boxers are clean and low-maintenance dogs. Their coat requires only weekly brushing and they shed very little. With that said, they do need regular dental and nail care just like any other dog! Their short coat does lead to another need, however: a wardrobe and sunblock. 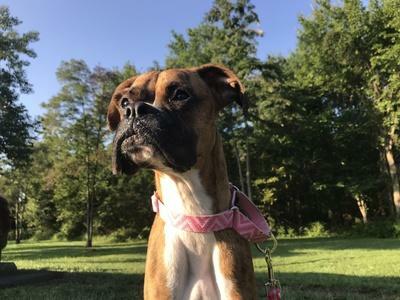 Boxers are highly temperature sensitive in both directions and so that should have a selection of coats for the cold months, and dog-safe sunblock, as well as central AC, for the hot months. Boxers generally have a happy disposition and they’re delightful to be around, whether you have one, volunteer at a rescue, or otherwise meet them out and about! They’re known for being gentle and patient with their pet parents, as well as with children. They do sometimes show aggression to other dogs if they haven’t met prior or when the dogs are of the same gender. But, if your Boxer is properly socialized, this tendency shouldn’t arise or cause much trouble. On that note, you’ll want to know that while Boxers don’t usually start fights, they will want to finish them. Always be sure that no matter where you are, you could get yourself and your dog to safety if an aggressor approached. Finally, although Boxers love hamming it up, they are highly intelligent dogs and will need just as much mental stimulation as physical stimulation! Get them toys that challenge them and don’t let them manipulate you and the rules you’ve set. If something has been missing in your life and you think it’s a Boxer, go ahead and visit Blue Ridge Boxer Rescue to see who’s up for adoption! If for any reason that’s not a viable option, consult the AKC website to find a reputable breeder in the local area. Once you have your Boxer baby, call NOVA Pets at (703) 378-9791 to arrange an initial exam, and don’t forget to check out our wellness plans!